ON Semiconductor who drives energy efficient innovations, announced sampling of ground-breaking LED Flicker Mitigation (LFM) technology in a new 2.3 megapixel (MP) CMOS image sensor that sets a new standard for automotive Advanced Driver Assistance Systems (ADAS) applications. Capable of capturing 1080p high dynamic range (HDR) video, the AR0231AT also has features that support Automotive Safety Integrity Level B (ASIL B). The LFM technology (patent pending) removes high frequency LED flicker from traffic signs and automobile LED lights and allows Traffic Sign Reading algorithms to work in all light environments. The AR0231AT has a 1 / 2.7 in. (6.82 mm) optical format and a 1928 (horizontal) x 1208 (vertical) active pixel array. It adpots the latest 3.0 micron Back Side Illuminated (BSI) pixel with ON Semiconductor DR-Pix technology, which offers dual conversion gain for improved performance under all lighting atmosphere. It captures images in linear, HDR or LFM modes, and offers frame-to-frame display switching between modes. The new device provides up to 4-exposure HDR, capturing more than 120 dB dynamic range with superior noise performance. 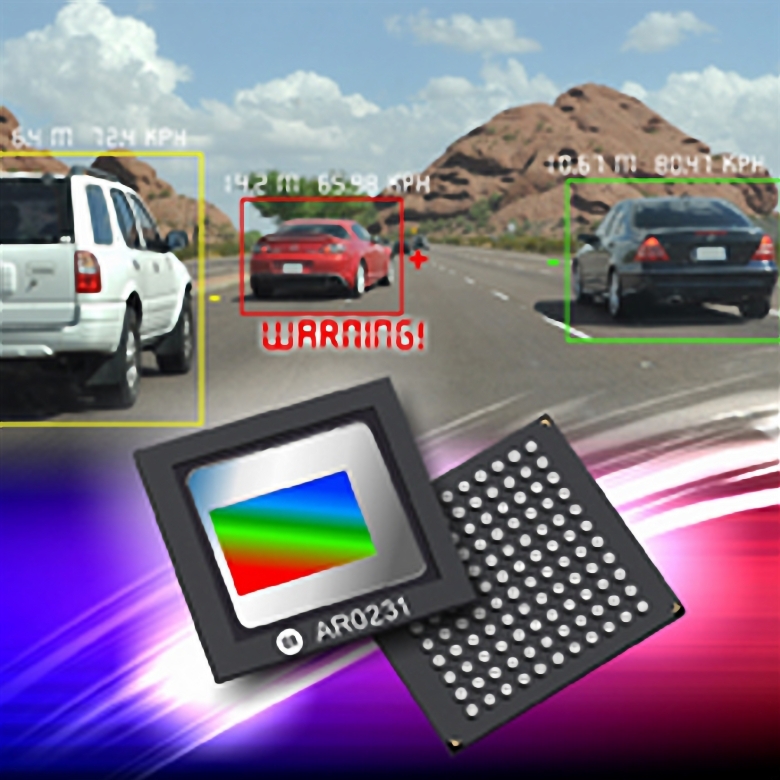 The AR0231AT is capable of multi-camera synchronization support to achieve easily in vehicle applications with multiple sensor nodes, and user programmability is achieved via a simple two-wire serial interface. It also has multiple data interfaces including MIPI, parallel and HiSPi. Other key features include selectable automatic or user controlled black level control, spread-spectrum input clock support and multiple color filter array options. ON Semiconductor is again showing its market leadership by being the first to deliver samples of a sensor with LFM in the AR0231AT, features that support LFM and ASIL B in a 2.3 MP, 1080p BSI image sensor, stand for a state of the art combination suitable for high performance automotive ADAS cameras. The AR0231AT is offered in an 11 mm x 10 mm iBGA-121 package and engineering protypes are available now. It has an operating temperature range of -40 to +105 degrees C (ambient) and will be fully AEC-Q100 qualified. It will be available in mass production in 2016.